Standing in Red Knot’s downtown location, concrete floors, brick walls and exposed ceilings instantly convey an industrial mood. Throughout an expansive showroom, contemporary couches, tables and accessories add splashes of color. A wall behind a workstation proudly showcases its name in colorful graffiti, and on one brightly hued sofa, a throw pillow with “COOL” embroidered on it adds a quirky playfulness to an already appealing display. One thing is certain: This isn’t your parents’ furniture store. The latest offering from industry leader C. S. Wo & Sons, Red Knot recently opened its doors to the public at locations on South Beretania Street and at Pearlridge. With C. S. Wo Gallery, HomeWorld, Ashley Furniture HomeStore and Slumber-World already among its family of stores, the company sought to provide a new concept to address the needs of a younger demographic. About a year ago, focus studies revealed a changing demographic of purchasers. Rather than simply adding to existing stores, C. S. Wo & Sons made the decision to create an entirely new brand. "We felt that the right way to do it is to give them their own store, their own environment and their own identity," says Wo. Deceptively simple, its name is derived from the Red Knot bird, known for being colorful and for having the largest migration in its category. This immediately appealed to merchandising manager Patrick Lee, who saw it as representative of Red Knot’s adventurous flare and hopeful longevity. Beyond that, the color red symbolizes good luck in Chinese culture, and “knot” refers to the company itself. 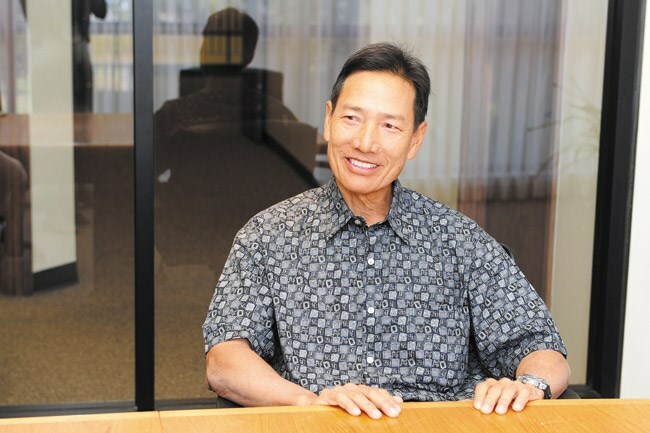 "Knot really referred to the ohana that we have here as a company," says Lee, "the unity, the solidarity, the strength." Everything about Red Knot is undeniably fun. “You can just feel the energy once you step into the store,” says team leader Honey Aubrey Millon. "The consumer base that we’re going after is one that really wants to express itself through color, through pattern, wants to create a space that’s different from everybody else’s," adds Lee. Every piece of furniture feels like a new discovery — something previously seen only on the Mainland and in magazines, but never on the island. Unlike most furniture shopping adventures that may end in forlorn sighs of defeat once price tags are revealed, each chic possibility is affordable. "This really was a way to bring that to Hawaii, and let them know that they too can have this type of furniture and create a space that looks really designer, but is affordable," says Lee. At a time when housing developments are quickly increasing condo and apartment living options, Red Knot’s furniture also is compact without sacrificing eye appeal. A sleek leather ottoman, for example, opens to reveal a comfortable pullout bed, and a round swivel chair (perfect for gamers) includes hidden storage under its cushion. Though its target demographic is intended to appeal to a younger crowd, Lee and Wo say that they’ve seen a range of customers shopping at Red Knot. “The presentation of this Red Knot concept is kind of geared toward the millennial group, but the appeal of the product lines and everything is very broad,” says Wo. Aside from its customers, Red Knot also has received the approval of younger members within the Wo family who provided feedback throughout the process. Red Knot’s inception may have begun about a year ago, but C. S. Wo & Sons’ lasting presence in the community stretches over a 105-year history. “Enhancing customers’ lives with home furnishings is what we do,” says Wo, “and we always want to maintain that leadership position, be innovative and progressive. Red Knot is located at 702 S. Beretania St. and at 98-107 Kamehameha Hwy. in Aiea. For more information, visit redknothawaii.com and find Red Knot on Facebook, Instagram, Pinterest and Twitter @RedKnotHawaii.